Dr. Michael Haines and his staff are committed to giving you, our family of patients, friendly and personal service. Our mission is to enhance and preserve your vision in a caring and professional atmosphere. Each patient’s signs and symptoms, along with your optometrist’s professional judgment, will determine what tests your optometrist conducts. A comprehensive adult eye and vision examination may include, but is not limited to, the following tests. The doctor will ask about any eye or vision problems you are currently having and about your overall health. In addition, a patient history will include when your eye or vision symptoms began, medications you are taking, and any work-related or environmental conditions that may be affecting your vision. The doctor will also ask about any previous eye or health conditions you and your family members have experienced. 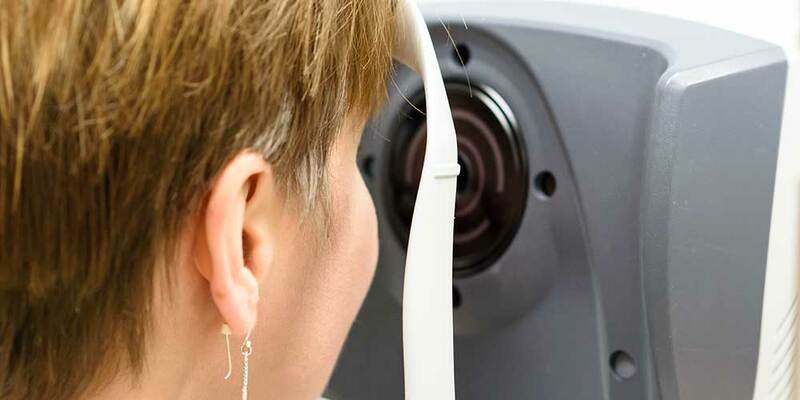 Visual acuity measurements evaluate how clearly each eye is seeing. Reading charts are often used to measure visual acuity. As part of the testing, you will read letters on charts at a distance and near. The results of visual acuity testing are written as a fraction, such as 20/40. The top number in the fraction is the standard distance at which testing is done (20 feet). The bottom number is the smallest letter size you were able to read. A person with 20/40 visual acuity would have to get within 20 feet to see a letter that should be seen clearly at 40 feet. Normal distance visual acuity is 20/20. The doctor may first want to look at specific aspects of your visual function and eye health. Preliminary tests can include evaluations of depth perception, color vision, eye muscle movements, peripheral or side vision, and the way your pupils respond to light. This test measures the curvature of the cornea (the clear outer surface of the eye) by focusing a circle of light on the cornea and measuring its reflection. This measurement is particularly critical in determining the proper fit for contact lenses. Refraction determines the lens power you need to compensate for any refractive error (nearsightedness, farsightedness or astigmatism). Using an instrument called a phoropter, your optometrist places a series of lenses in front of your eyes. He or she then measures how these lenses focus light using a handheld lighted instrument called a retinoscope. Your doctor may choose to use an instrument that automatically evaluates the focusing power of the eye. The lens power is then refined based your input on the lenses that give you the clearest vision. This testing can be done without eye drops to determine how the eyes respond under normal seeing conditions. However, an optometrist will use eye drops with patients who can’t respond verbally or when some of the eyes’ focusing power may be hidden. The drops temporarily keep the eyes from changing focus during testing. To see a clear, single image, the eyes must effectively change focus, move and work in unison. An assessment of accommodation, ocular motility and binocular vision determines how well your eyes focus, move and work together. This testing will look for problems that keep your eyes from focusing effectively or make using both eyes together difficult. Your doctor may need to perform additional tests based on the results of the previous tests. These tests can help confirm or rule out possible problems, clarify uncertain findings or provide a more in-depth assessment. At the completion of the examination, your doctor will evaluate all the test results to determine a diagnosis. He or she will discuss with you any visual or eye health problems and explain treatment options. In some cases, your doctor may refer you to another optometrist or other health care provider for consultation or treatment. At the completion of the examination, your doctor will assess and evaluate the results of the testing to determine a diagnosis and develop a treatment plan. He or she will discuss with you the nature of any visual or eye health problems found and explain available treatment options. In some cases, referral for consultation with, or treatment by, another optometrist or other health care provider may be indicated. We invite you to make an appointment for yourself and your family today. about any diagnosed eye or vision conditions, or treatment recommendations, don’t hesitate to contact us for additional information or explanation.